Each year, we send our children to school with the understanding that the most important thing they should have to worry about is their education. For some students around the country, that isn't true. Their focus is on finding a place to sleep that night. 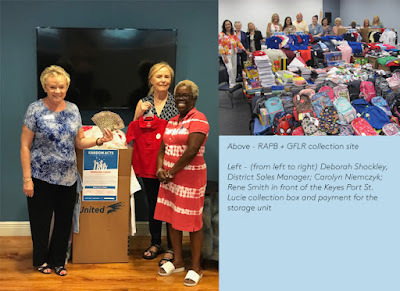 This year, the Realtor Association of the Palm Beaches and the Realtor Association of Greater Fort Lauderdale reached out to its members to see if we would be willing to collect clothing and school supplies. At our Summer CEO Tour event on July 24th, we hosted our St. Lucie County Schools District Homeless Liaison, Kylee Fuhr, where she spoke with us about the importance of this initiative. After learning about the over 1,800 homeless students in the area, we made a huge effort to give for these children. Lisa Crovato & Sonny Solomon from the Port St. Lucie office volunteered to cover the cost of a storage unit for a year where the Treasure Coast Community Outreach Events Committee will make these supplies available to the kids that need them. Our other Associates more than filled our office donation box, and Mike & Tim Pappas approved a donation on behalf of KeyesCares with which we purchased clothing in various sizes. I want to give a special thanks to Carolyn Niemczyk & Rene Smith for helping to spearhead the efforts in the office. On August 3rd, we brought everything to the Port St. Lucie RAPB + GFLR office, making a sizable contribution to the collection.